By tracking the free-floating capsulotomy rates in more than 300 surgeons and nearly 70,000 laser assisted cataract cases, we determined that corneal folds due to patient movement are the most common reason for tags. 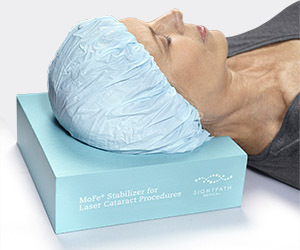 The MoFe Stabilizer is designed to help reduce patient head movement, thus increasing the likelihood of a free-floating capsulotomy. This device also elevates the neck to create an even plane for effective laser docking. The MoFe Stabilizer has an easy-to-clean, non-porous surface made from durable, medical grade foam, is latex free and hypoallergenic.